For other people named Mary of Burgundy, see Mary of Burgundy (disambiguation). Mary (French: Marie; Dutch: Maria; 13 February 1457 – 27 March 1482), Duchess of Burgundy, reigned over many of the territories of the Duchy of Burgundy, now mainly in France and the Low Countries, from 1477 until her death. As the only child of Charles the Bold, Duke of Burgundy, and his wife Isabella of Bourbon, she inherited the duchy upon the death of her father in the Battle of Nancy on 5 January 1477. Owing to the great prosperity of many of her territories, Mary was often referred to as Mary the Rich. Mary of Burgundy was born in Brussels at the ducal castle of Coudenberg, to Charles the Bold, then known as the Count of Charolais, and his wife Isabella of Bourbon. Her birth, according to the court chronicler Georges Chastellain, was attended by a clap of thunder ringing from the otherwise clear twilight sky. Her godfather was Louis, Dauphin of France, in exile in Burgundy at that time; he named her for his mother Marie of Anjou. Reactions to the child were mixed: the baby's grandfather, Duke Philip the Good, was unimpressed, and "chose not to attend the [baptism] as it was only for a girl", whereas her grandmother Isabella of Portugal was delighted at the birth of a granddaughter. Her illegitimate aunt Anne was assigned as her governess. Philip the Good died in 1467 and Mary's father assumed control of the duchy of Burgundy. Since her father had no living sons at the time of his accession, Mary became his heir presumptive. 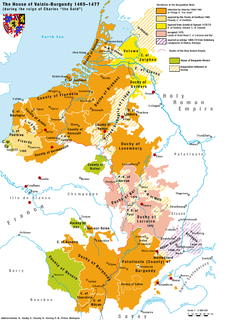 Her father controlled a vast and wealthy domain made up of the Duchy of Burgundy, the Free County of Burgundy, and the majority of the Low Countries. As a result, her hand in marriage was eagerly sought by a number of princes. The first proposal was received by her father when she was only five years old, in this case to marry the future King Ferdinand II of Aragon. Later she was approached by Charles, Duke of Berry, the younger brother of King Louis XI of France, who was intensely annoyed and attempted to prevent the necessary papal dispensation for consanguinity. As soon as Louis succeeded in producing a male heir who survived infancy, the future King Charles VIII of France, Louis wanted him to be the one to marry Mary, even though he was thirteen years younger than Mary was. Nicholas I, Duke of Lorraine, was a few years older than Mary and controlled a duchy that lay alongside Burgundian territory, but his plan to combine his domain with hers was ended by his death in battle in 1473. Mary assumed the rule of her father's domains upon his defeat in battle and death on 5 January 1477. King Louis XI of France seized the opportunity to attempt to take possession of the Duchy of Burgundy proper and also the regions of Franche-Comté, Picardy and Artois. Mary was compelled to sign a charter of rights known as the Great Privilege in Ghent on 10 February 1477 on the occasion of her formal recognition as her father's heir (the "Joyous Entry"). Under this agreement, the provinces and towns of Flanders, Brabant, Hainaut, and Holland recovered all the local and communal rights that had been abolished by the decrees of the dukes of Burgundy in their efforts to create a centralized state on the French model out of their disparate holdings in the Low Countries. In particular, the Parliament of Mechelen (established formally by Charles the Bold in 1470) was abolished and replaced with the pre-existing authority of the Parliament of Paris, which was considered an amenable counterweight to the encroaching centralization undertaken by both Charles the Bold and Philip the Good. The duchess also had to undertake not to declare war, make peace, or raise taxes without the consent of these provinces and towns and only to employ native residents in official posts. Such was the hatred of the people for the old regime that in spite of the duchess's tears and entreaties, two of her father's most influential councilors, the Chancellor Hugonet and the Sire d'Humbercourt, were executed in Ghent after it was discovered that they were in correspondence with the king of France. 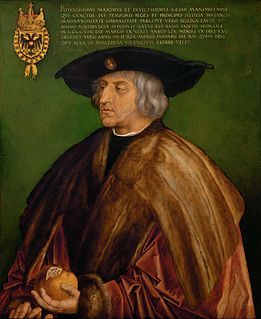 Mary soon made her choice among the many suitors for her hand by selecting Archduke Maximilian of Austria, the future Holy Roman Emperor Maximilian I, who became her co-ruler. The marriage took place at Ghent on 19 August 1477. 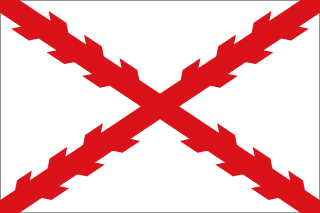 Mary's marriage into the House of Habsburg initiated two centuries of contention between France and the Habsburgs (later of Kings of Spain as well as Holy Roman Emperors), a struggle that climaxed with the War of the Spanish Succession in the years 1701–1714. In the Netherlands, affairs now went more smoothly; the French aggression was temporarily checked, and internal peace was in large measure restored. In 1482, a falcon hunt in the woods near Wijnendale Castle was organised by Adolph of Cleves, Lord of Ravenstein, who lived in the castle. Mary loved riding and was hunting with Maximilian and knights of the Court when her horse tripped, threw her in a ditch, and then landed on top of her, breaking her back. She died several weeks later, on 27 March, from internal injuries, having made a detailed will. She was buried in the Church of Our Lady in Bruges on April 3, 1482. Her 2-year-old daughter, Margaret of Austria, was sent in vain to France, to marry the Dauphin, in an attempt to please Louis XI and persuade him not to invade the territories owned by Mary. 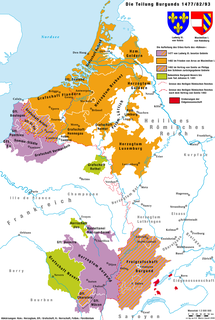 Louis was swift to re-engage hostilities with Maximilian and forced him to agree to the Treaty of Arras of 1482, by which Franche-Comté and Artois passed for a time to French rule, only to be recovered by the Treaty of Senlis of 1493, which established peace in the Low Countries. 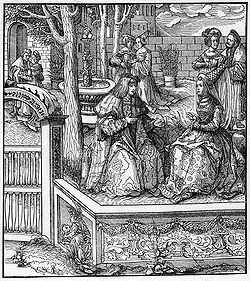 Mary's marriage into the House of Habsburg would prove to be a disaster for France, since the Burgundian inheritance would later bring it into conflict with Spain and the Holy Roman Empire. Mary's son Philip succeeded to her dominions under the guardianship of his father. Philip the Handsome (22 July 1478 – 25 September 1506), who succeeded his mother as Philip IV of Burgundy and became Philip I of Castile through his marriage to Joanna of Castile (known to history as "Juana la Loca"). Margaret (10 January 1480 – 1 December 1530), married firstly to Juan, Prince of Asturias, the son and heir of King Ferdinand II of Aragon and Queen Isabella I of Castile, and secondly to Philibert II, Duke of Savoy. Francis (2 September 1481 – 26 December 1481). Wikimedia Commons has media related to Mary of Burgundy. ^ a b c d e f g One or more of the preceding sentences incorporates text from a publication now in the public domain: Chisholm, Hugh, ed. (1911). "Mary, duchess of Burgundy" . Encyclopædia Britannica. 17 (11th ed.). Cambridge University Press. p. 824. ^ Koenigsberger, H. G. (2001). Monarchies, States Generals and Parliaments: The Netherlands in the Fifteenth and Sixteenth Centuries. Cambridge University Press. ISBN 9780521803304. ^ Paul Murray Kendall, Louis XI, (W.W.Norton Co. Inc, 1971), 319. ^ G. R. Potter (Edited by), The New Cambridge Modern History - Volume I: The Renaissance (1493-1520), Cambridge University Press, Cambridge, 1957, p. 228. ^ "ONZE-LIEVE-VROUWEKERK (CHURCH OF OUR LADY)". VisitBruges.com. Archived from the original on March 13, 2014. Retrieved March 13, 2014. ^ Charles W. Ingrao, The Habsburg Monarchy, 1618–1815, (Cambridge University Press, 2000), 4. Philibert II, nicknamed the Handsome or the Good, was the Duke of Savoy from 1497 until his death.